Updated Israeli assessment shows Iran terror proxy has far more firepower than thought, and has been arming despite Syria war. An updated Israeli security assessment has placed the missile arsenal of Hezbollah, the Iranian Shi'ite terror proxy in Lebanon, as much higher than the previously thought 100,000 rockets - which was already roughly ten times more than those in Hamas's possession. 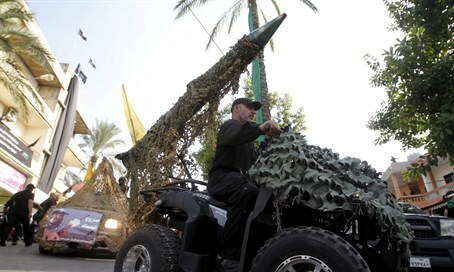 According to the new figures, Hezbollah has no fewer than 150,000 rockets aimed at Israel, reports Walla on Thursday. A majority of the missiles are short-range, but the arsenal includes a large number of the long-range variety as well, and many Iranian rockets from Hezbollah's backers in Tehran. It appears that Hezbollah is continuing to obtain ground-to-air rockets of the SA-17 and SA-22 type, as well as Yakhont (P-800 Oniks) supersonic cruise missiles, according to the assessment. Hezbollah has been fighting for Iran in Syria to prop up the regime of Bashar al-Assad, in a strategic fight allowing Tehran to keep a channel open through to Hezbollah and the Mediterranean Sea and thereby transfer weapons and expand its regional influence. No official figures have been released regarding how high the losses Hezbollah have suffered in Syria are, but at least 2,000 Hezbollah terrorists are said to have died in the warfare, including senior members of the organization. However, despite the intense fighting Hezbollah has continued arming itself with rockets to be used against Israel. It has been acquiring short and medium range missiles from Syria, as well as long range missiles from Iran, and has also established a fleet of attack drones. Israel has adopted a policy of striking to prevent the transfer of advanced game-changing missiles en route to Hezbollah. Just yesterday (Wednesday), Arab media reported an Israeli airstrike on Damascus International Airport, with reports indicating power was knocked out and flights were temporarily halted after powerful explosions were heard. Some reports indicated the target in the alleged strike was an Iranian shipment of weapons intended for Hezbollah. Hezbollah has attacked Israel on numerous occasions, including a lethal cross border attack this January, and has fought two wars against the IDF in Lebanon. Former Foreign Minister Avigdor Liberman (Yisrael Beytenu) warned late last month that Hezbollah leader Hassan Nasrallah's rare statement days earlier meant Hezbollah intends to attack Israel again soon, since the fighting in Syria is reaching a potential close, as world nations press for a diplomatic solution.